Beautiful, Lucy, I especially love the rich tan scrolly paper. This is such a beautiful card Lucy ... Absolutely stunning! Love this card Lucy, such yummy colours!! This is so elegant and lovely! Just beautiful! 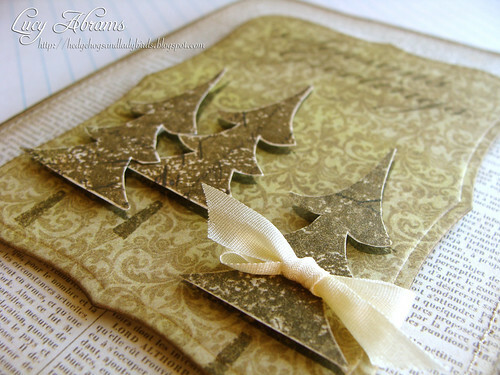 Love how you're using non-Christmas paper, this is so elegant! Gorgeous-ness! Beautiful Christmas card inspiration! Such a gorgeous card, Lucy! Love your trees and the one with the bow is perfect! A bit of snow still left here from our last storm. Today is very warm for Minnesota this time of year. . .44 degrees and it's pouring rain. The temps are suppose to drop tonight, rain turning to snow with 3 to 5 inches of the white stuff falling by morning. It's pretty but I hate driving in it! Have a warm and cozy night! Oooh! WOW! Lucy, I love this card so much, what a beautiful design. I am actually speechless and don't know what to write here...LOL, I just love it. 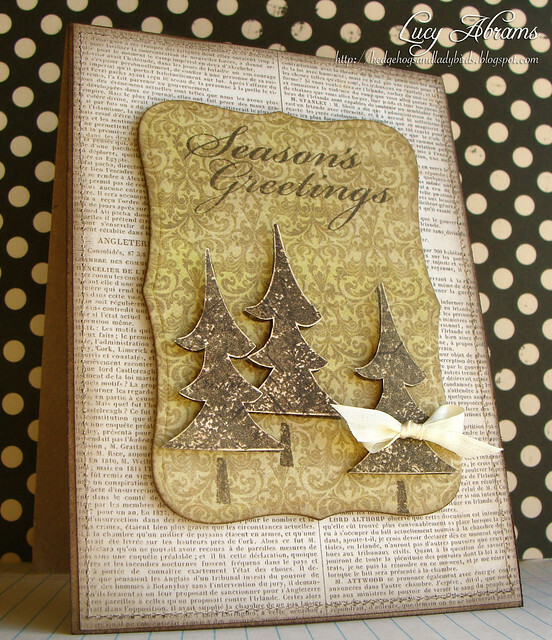 Lovely and elegant muted feel to this card. Great ideas for using non holiday stuff. Love this. It is elegant and beautiful. You don't need Christmas paper when you can come upwith something like this!!! You are the essence of creativity. Had you not told me that these were not Christmas papers, I never would have known. This is a fabulous card, not to mention a beautiful Christmas card! Wow it is gorgeous, Lucy. love the ribbon around the tree! Well you certainly achieved what you set out to. This card definitely has the vintage feel and is totally gorgeous! Keep up your very inspiring work! So GORGEOUS and elegant ..love it! Wow, I like this one, great job ! absolutely gorgeous and so so elegant. love love it, Lucy! hope you stay warm and cozy! great job anyone would be honored to get in the mail for the holidays. I just found you recently beause of the Hero Art blog hop. And you are now my all time favorie stamper! I really love your clean look and attention to detail. I've already spent half an hour on your site and I'm loving every minute. Thank you sooo much for saring your talent on this blog. Ahhh...I love all your work. I chose this card to comment on because it's amazing. I love everything about this card.